While the loader tractor is commonly perceived as a small, nimble outfit mainly confined to yard work, a new breed is emerging. Jane Carley reports. Mid-range tractors which can haul and power larger implements are being fitted with high capacity loaders to fulfil a wider range of tasks. With a varied workload including drilling, ploughing and baling silage and straw, tractor versatility is key for David Marshall Agricultural Contractors of Albrighton, Shropshire. As a result, the tool of choice for materials handling is a tractor and fore-end loader. David Marshall bought a loader-ready 170hp John Deere 6150R and H380 loader in 2013, replacing a JD 6930 loader tractor, and subsequently fitted loader brackets to his 2011 180hp John Deere 7530. 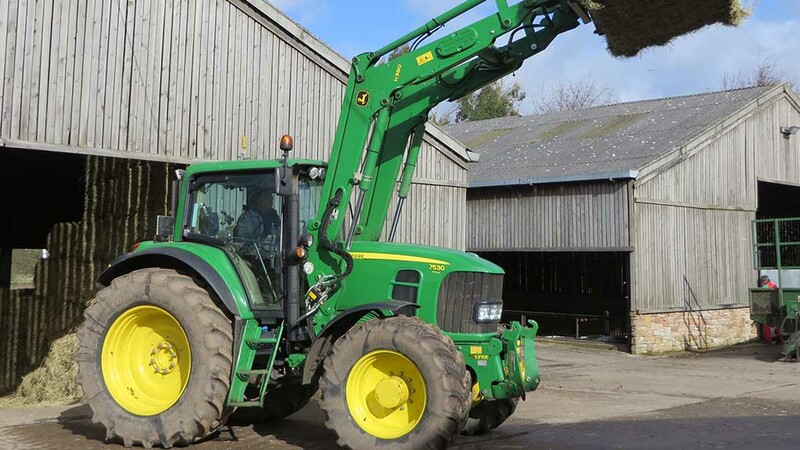 “Most of our materials handling work entails loading bales onto trailers or into barns and loading muck spreaders, so manoeuvrability is not really an issue,” Mr Marshall explains. Currently the H380 loader, which can lift 2,150kg to 4.5 metres, is shared between the two tractors, but Mr Marshall is considering buying a second unit. Another benefit is resale value, as Mr Marshall’s dealer, Cornthwaite Tractors, says a mid-sized tractor with a loader stands out among other similar second-hand tractors, which was proven with the JD6930. Both tractors have been specified with Deere’s AutoPowr transmission which gives stepless shifting, making loading cycle times comparable with a telehandler, he suggests. The 6150R also handles a buckrake during forage harvesting and the front two spool valves on the tractor have been linked to the loader controls for easier connection and operation. “The central docking for the all the electrics is very simple and saves a lot of time whether on the loader or buckrake,” Mr Marshall says. The H380 loader is specified with mechanical self-levelling which avoids the need to correct the load, useful with big square bales or heavy loads of muck. The ‘loader-ready’ kit on the tractor includes an extended glass roof which gives the driver a good view of the load at full height. Other advantages of the tractor-loader combination, he says, include the ability to travel quickly across the field when loading bales, extra grip from the big tyres on the tractor with a heavy load of muck, plus the extra torque to get into heaps. Durability has proved impressive, even with the contractor’s workload, says Mr Marshall, and maintenance is simply down to regular greasing. BF Grounds Maintenance Ltd makes daily use of a four-cylinder 160hp MF6616 tractor with MF958 fore-end loader as its workhorse. Bradley Faulkner and his team of 15 operators undertake fencing, groundworks and ditching on farms in Essex and Suffolk, as well as landscaping, equestrian developments and highways and civil works. “We need to move a lot of equipment, such as diggers and a tracked post driver, on busy roads and the MF6616 can tow the low loading trailer at 50kph,” Mr Faulkner explains. Other regular tasks for the loader, which can lift 2.37 tonnes to 4m, are to operate a muck grab for clearing scrub to be chipped or burnt and a soil bucket for moving loose materials. The 63-plate MF6616 has clocked up more than 1,200 hours since it was delivered in December 2013, replacing an MF6470 loader tractor. “We did try another brand in between, but their biggest four-cylinder tractor was 125hp and we had a few electrical issues, so swapped back to the MF,” he says. The MF6616 is specified with the firm’s Exclusive armrest control package, which is loader-ready with multi-function electric joystick and this is a big step forward, says Mr Faulkner. Massey Ferguson’s Dyna-6 powershift transmission has been chosen for its simplicity which makes the MF6616 a tractor which any member of the team can jump on, although he suggests an owner-operator might prefer the sophistication of the stepless Dyna-VT box. However, he concedes forward visibility when picking up or placing a load at floor level is restricted by the large bonnet and often uses a banksman to ensure a clean pick-up. Mr Faulkner says he also has a MF5613 with sloping bonnet in his fleet which would give improved visibility but, at 100hp and with a top speed of 40kph, it lacks the muscle for the big jobs. High level views of the load are praised with the glass roof on the MF6616 proving useful for loading trailers or stacking materials. The loader stays on the MF6616 unless extra tractor power is called on for a major hedge and verge contract, in which case it can be quickly swapped for a front mower and a reach arm to the rear. 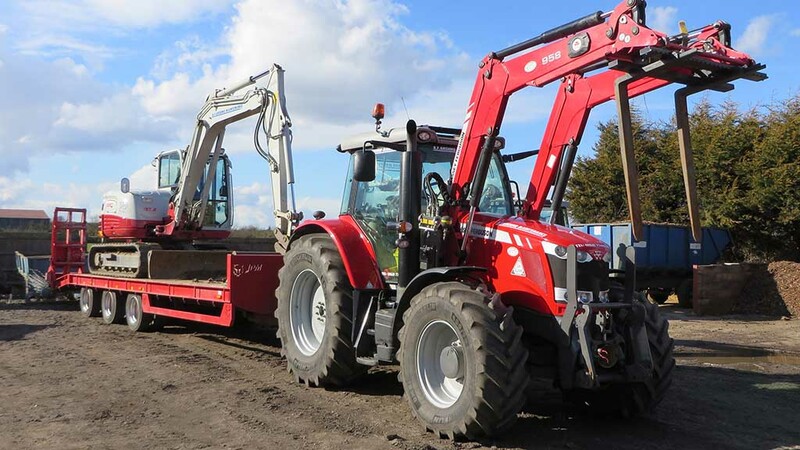 Mr Faulkner also operates a telehandler, and says while it is more manoeuvrable around the yard and sometimes goes on the low loader as a back-up, it would not be as suitable for towing and site work as the tractor-loader combination. Resale value of the MF6616 as a loader tractor is a moot point, he suggests, as farmers who would be potential customers would be more likely to opt for a smaller four-cylinder machine or prefer six cylinders at 160hp. “We can put 4,000 hours on a tractor and, with the fixed costs of the service package and its versatility, the MF6616 is proving a great all-rounder,” says Mr Faulkner.